You would think that three weeks cave diving in Mexico would equal a lot of memories. And you would be right! Three weeks also can blur together with such great diving, which was what happened on this trip. In hindsight I should have written notes every day, but there just never seemed to be time. We were either training, sleeping, eating, diving or getting ready to do one of those. I'd like also to reassure anyone reading this that I didn't undertake cave diving lightly. I only did it after receiving the highest level of training, using the most conservative procedures, the best equipment and with the best instructors possible. Everything was geared to make it safe and fun. 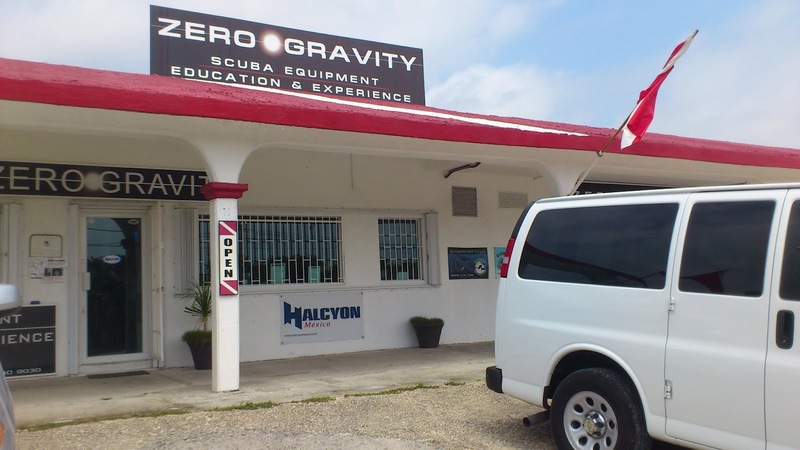 Cave diving can be dangerous, but with the right training, equipment, and procedures, it is not much different than driving. Arriving in Cancun first was Dave and Daniel and I. We had a long flight, with some delays. It worked out better for Dave and I because we got bumped to a direct flight instead of having to take a jog up to Ottawa. The fun continued with some rental car problems, and a flat tire in the parking lot. We had reservations for a van, but the person who was supposed to meet us was nowhere to be found. Stepping outside Cancun airport was not for the faint of heart. You were immediately bombarded by offers for taxis and car rentals. Further fun was a lack of ability to communicate amongst our groups. Greg, Shawn and Jim were arriving later that day, and we spent a good deal of time waiting for them to arrive. It was pretty amusing that WestJet could not tell you what passenger was on what flight. In the end, we retrieved everyone, visited a very shady tire repair shop, found Costco (and bought food), and made it to the condo in Puerto Aventuras after getting lost in the complex several times. Street signs in Puerto Aventuras (and Mexico in general) didn’t seem to exist! 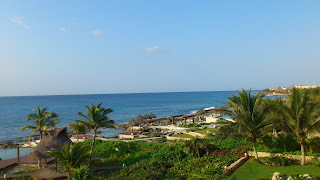 Here is a picture of the view from our condo. The following day, we found Zero Gravity and met Guy. We got some doubles and went with Guy over to a cenote called Carwash. Later I would find out from Christophe that it was called Carwash because in the 70s, a taxi company would wash their cars there. We got our first taste of the famous cenotes at Carwash. The water was very clear and very warm. So were we! The heat was something else. We all wanted to try out our undergarments and weighting. Most of us found that we needed to take off some weight and some layers too. Carwash was a lot of fun. We did valve drills and gas sharing drills, as well as explored the cavern zone a bit. There were the famous “stop” signs at the end of the cavern zones. Dave had to take a picture. The stop signs were a common thing in caves, to warn untrained divers not to go further. There were some very interesting fish in Carwash, and poor Greg had a bad leg cramp on one drill that I captured on video. See the bottom of the page. The next day, the course started. We met Christophe and Mark, and started down to business. 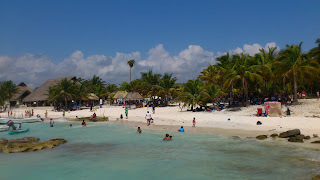 We did some overview in the classroom, then picked up sets of doubles and headed to cenote Eden. We had some excellent weather, much cooler than the day at Carwash. We finished off the swim test first in Eden, and it was a great place to do it with a very large and nice pool. Dave just made the swim test, in 13 minutes and 54 seconds and we all congratulated him. After the swim test, we geared up and did a short cavern dive to check out what it was like to be in the cave. I don’t remember much about that first dive any longer, but a constant theme from Christophe was communication and teamwork. I was rushing far too much. We had many of the skills, but it was the extra refinement that was really needed. Cave diving was about finesse, not brute force or speed (another theme was rushing). Eden closed strictly at 5pm, and a famous line from Christophe went something like this “I don’t mean to rush you, but we need to be packed up and leaving in 5 minutes. No rush though.” Quite funny! We went back to the shop for more lectures, and then packed it in. At the end of day one, we had an idea of what the routine would be like. It was tough. 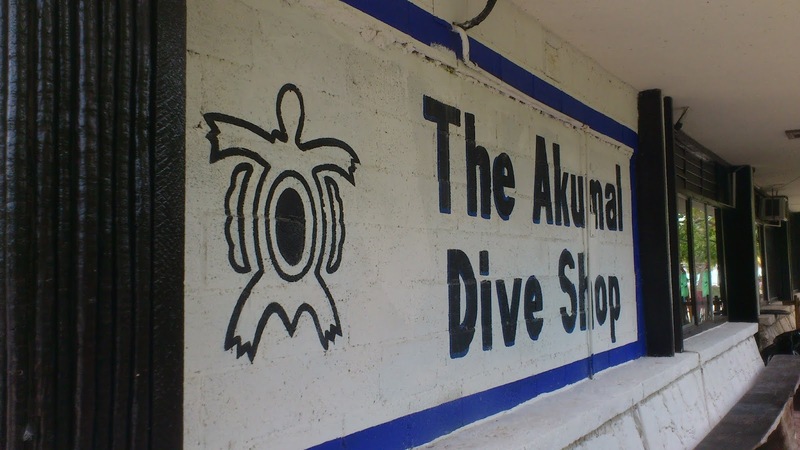 We met at the shop for 8am, got gear together, and then went diving. Back to the shop for lecture, and then home to dry out wet gear and get ready for the next day and make some food and get some sleep. Rinse and repeat. It was hectic. Christophe's truck was full to the brim of equipment as well. Day 2 was back to Eden again, and did dry land practice on running line. We were introduced to the idea of the “titanium grip”, never let go of the line! Before the first dive we got caught by a torrential downpour. We raced to get our drysuits on, and just made it. Boy did it ever come down! Back into the cavern for another cavern dive, and then Christophe took us into the second tunnel at Eden called River Run. Here we ran into the halocline for the first time. It was very cool. It was almost like seeing a layer of air over top of the water, but it was just fresh water lying on top of the salt water. It was hard to describe but there are lots of videos of it. For example here is a good piece from the BBC Planet Earth Cave episode. In the dive debrief, Christophe looked into each of our eyes and very seriously asked if we wanted to continue cave diving. I knew I did. At the time, I didn't quite understand all the mental and physical aspects of cave diving, but I knew I felt pretty comfortable and wanted to see more. We spent a lot of time on gas sharing exercises and valve drills, along with a few failures. Very quickly Christophe pinpointed areas to improve. Communication, teamwork, awareness and slowing down were the common themes for us. That evening we discovered that heavy downpours create big puddles in Mexico in some areas. There was not the same level of storm sewer infrastructure, and they got clogged easily. We had to ford a couple of big ones in the van but made it fine. Day 3 was in Xtabay. I honestly can’t recall much about it now. I do remember that we did gas sharing on the line, and Christophe continued to reinforce the same comments. We used 60 bar in 8 minutes at a 9m average depth, and travelled maybe 30m until we stopped sharing – that’s was a lot of gas and far too slow. The cenote was quite nice, like a big pond, and Dan and I spent a few minutes swimming around in it looking at the turtles and fish at the end of the day. Day 4 was in Tah Mahal. By this time, the course was beginning to wear on everyone. We were getting home around 8, which left little time to prepare for the next day let alone unwind. By the time we met at the shop, did the day’s diving, debriefed, got back to the shop and did the lecture it was an almost 12 hour day. Today I think we had an early day, which was very much needed. It gave us some time to get some groceries and do some other things. During the debriefs, Christophe was still saying the same things, awareness, slowing down and teamwork. Taj Mahal had what Christophe called the DCS Dome, where the passage went from 13 meters to 1 meter and then back down to 13. At the top, you were swimming just under the surface of the water, and you could actually poke your head out if you wanted. There were also tree and plant roots dangling down into the water that were like big brown feathery structures. This was not something we had seen before. Also, the long days and pressure started to get to me because I remember second guessing if I really wanted to keep going. We practiced lost diver drills at Taj Mahal, and we had to find a hidden backup light back in the cave. The drill went pretty well, and we did find the light. Part of the lost diver drill was covering your light, and Mark made sure to emphasis to cover it for at least 30 seconds to let your eyes adjust. We also did an exit with all lights gone, in touch contact on the line, it was fun! Day 5 arrived and I started to realize that the course was almost over. When I woke up, thoughts of not continuing were gone. I realized that it was just nerves, and that I really did want to see more of the caves. It was a very great privilege to see things that many do not, safely and without disturbing what was there. I started to get just how much skill, finesse and awareness a good cave diver needs. It would take a long time, but I’d get there too. Christophe’s famous quote was that we were “baby cave divers”. He did it in a very funny voice. We had to go to Carwash, the same place we were when we did our checkout practice. We were supposed to go to Mayan Blue, but the people were not there which I gathered was not unheard of. Carwash was pretty fun. 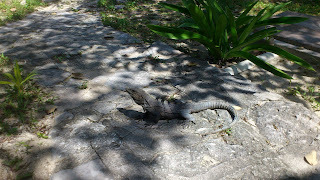 There was a small crocodile that we were lucky enough to see there. Again, Christophe had the same comments on the debriefs, and I felt he was getting concerned. It was becoming a real issue in that we were not fixing the team problems and the relaxing and the communication. We had a good talk about it in the water. We also did lost line drills, and had to find the line after getting turned around and blindfolded in the cave. It took me half an hour to find the line again, but I found it! I remember the two tunnels of Carwsah being pretty darkly stained with tannin. At the time, I wasn't very impressed by these dark tunnels in comparison to the start white tunnels of the other cenotes. There was a long lecture this evening to get finished up. Poor Shawn was having a hard time staying awake. Day 6 dawned, and it was the last day. It was time to pull everything together and hope that Christophe saw enough improvement over the course to give us a pass. I might be making it sound like the course was all negative and hard. This wasn't the case. It was very fair (and fun), and the feedback from Christophe was honest and given in a way to help improve. It was just hard to take sometimes, since I was having a hard time accepting that it was like being back to square one in terms of skills in some ways. In the open ocean you could be quite sloppy I realized. In the cave all those bad habits come out very quickly, and needed to be fixed. We went to Mayan Blue for the last day. It was beautiful. Orchids were on the trees, the water had a crystal blue hue, and it was almost clear as air. Christophe warned us of the grey scaly barked trees with black sap coming out. The sap would burn like acid. The tree was called the Black Posionwood tree (Chechen or Che Chen) and I learned from my Mom that it was in the sumac family which contained the poison ivies. The mature tree had thin grey bark with scaly reddish brown patches. There was an antidote tree called the Gumbo-limbo or Copperwood or Chaca tree. It had reddish peeling bark that was like an extremely sunburned person. Its sap could be used to treat the Poisonwood rash. Mayan Blue had three tunnels, A, B and the Dead Zone. B tunnel was our first dive, and it was amazing. White, clear and very decorated with speleothems (http://en.wikipedia.org/wiki/Speleothem). We had no failures on this dive, and in some ways that was a bit worse. I was expecting something to fail at any moment, but nothing ever did. I suspected the plan was to give us a nice dive to remind us it was not all about work and failures. On the second dive, we did A tunnel which was darker, the rock stained with tannin. Again, at the time I didn’t think the dark tunnel was all that great compared to B tunnel. We had various failures during this last dive, and worked through them alright. On the way back, we had lunch at the famous Road Kill Chicken place. It had become a bit of a tradition to have lunch here after the cave diving classes finished. 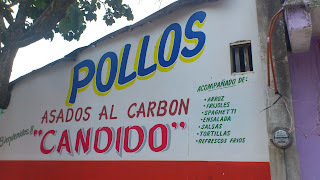 The place was not much to look at, but the chicken tasted great, very nicely spiced. It was flattened and cooked on a charcoal grill. An odd side dish along with it was spaghetti, but for 60 pesos, it was dirt cheap! Back at the shop, we did the exam and answered 3 questions about what our strengths, weaknesses, and what we’d do to fix them. Then we spent time as a team with Christophe discussing these, and getting feedback. It was one of the best exercises post course I’d done. It was hard to recognize things that you needed to work on. It was very valuable though. In the end, Christophe said that he needed to determine if he could sleep at night knowing we’d be safe in the caves. He gave us 3 out of 5, which coming from him was pretty good! He said he had never given a 5, and there were few 4s. So we had passed! But there needed to be a lot of improvement. On Sunday we went on a boat dive in the ocean. Jim, Shawn, Greg and Guy did a tech dive, and me, Dave and Dan did a recreational dive. The day was super-hot, and we met the boat a bit south of Peurto Aventuras on the beach near Akumal. The boat was too small to take us all at once, so we split it up into two runs. We went out second. The ocean was very rough that day (as it was almost every day) and it was a challenge to get into and out of the boat. It was a long open boat that was not set up well for double cylinders, but we made it work. On the trip out, Dan’s fins almost got thrown out of the boat from the swells, and Dave almost fell over at one point. We did a dive called Grouper Canyons, which was a series of reefs interspersed with sand beds. It was quite fun. We saw a nice moray eel, a lionfish, a nice big turtle and lots of reef fish. No groupers alas. In hindsight, the boat was fun, but it was a lot of work for not a great deal of reward. 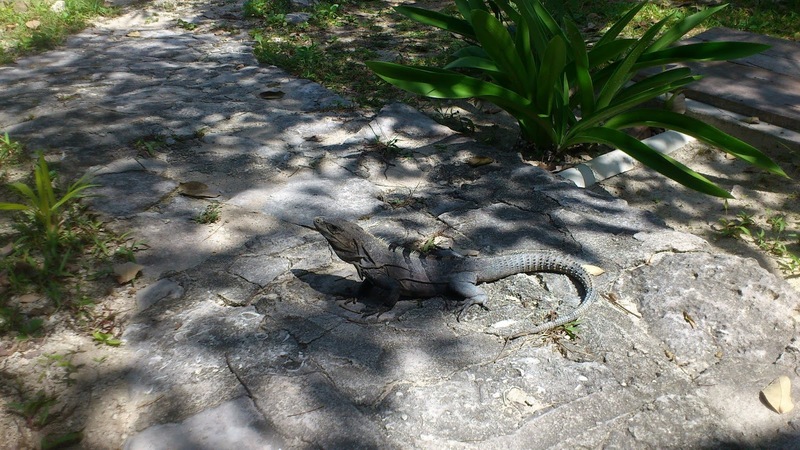 There was a big iguana that I saw too. After the boat ride, we went back to Taj Mahal for our inaugural post-course cave dive. Funny enough, I still can’t remember much about the cave there other than the DCS dome. We did so many so quickly and they were all so beautiful that they tended to blur together. That evening we had dinner with Christophe and Mark, along with all in the class and Guy who had been teaching a Tech 1 class. I had a good chance to talk to Mark which was great. He had a lot of good positive advice and reminded me that we could reach out and ask them any question any time. It was great to have such a relationship with instructors that doesn’t stop at the end of the course. Steve Redding joined us too, and we had a great time chatting with Mark. Mark told a story about watching a snake in Florida explore his buddy on a deco stop for half and hour, and another story about someone scaring a snake into the water just before a dive. His comment to the person was “oh great, we used to know where it was, now we don’t!”. Very funny. Monday we started cave diving in earnest. Greg and Shawn were leaving soon, so they wanted to get as many dives in as possible. We decided on Nohoch for this day, and it was a real jungle trek. The road had only been completed a few years ago, and for a long time any diving of Nohoch had you hauling in gear via donkey. 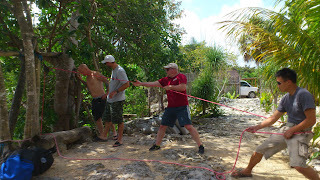 We lowered our gear down into the cenote, as it was a bit easier than walking it in. Nohoch turned out to be one of our favourite caves. Long and shallow, so you could go a long way on the gas we set aside. My primary light died at the end of these dives we spent so much time in the water. I wasn’t able then to participate in the exploration of the zipline side of Nohoch, where the other team discovered two additional lines. We didn’t have the gas to explore them this time, so we planned to come back. Nohoch had orange trees with oranges that smelled very good, but tasted terrible. Shawn had to leave the next day, so we gave him a ride to the airport in the morning, and got lost looking for Costco. We bought way too much food, which we’d find out later. 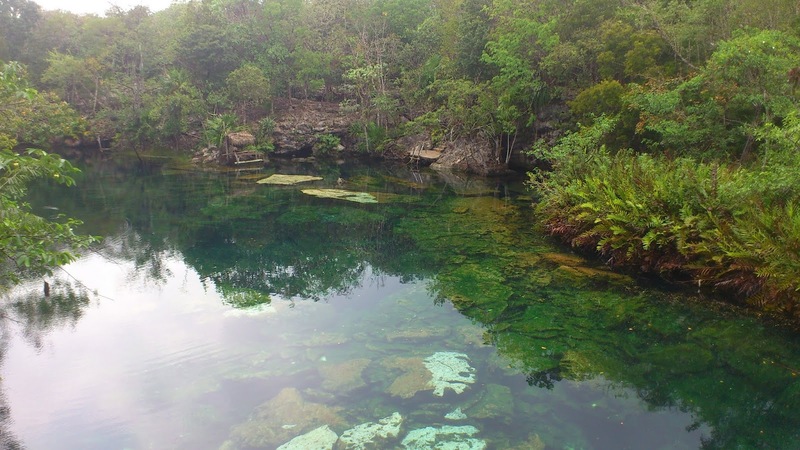 Once we got back, Greg wanted to do Grand Cenote, so we went there for 2 dives. Grand Cenote was another of the best dives. There was a gap in the line that we got to, but didn’t have the gas to take. Again, we planned to come back. We learned a lot on what looked like a T as well, which turned out to be a jump spool that was tied into the mainline. Up to this point, we’d not come across any jump spools installed yet. It was good to start seeing these things and exercising the procedures of recognizing them, dropping cookies and negotiating them. Greg had to leave the next day, and we did the same thing of dropping him off at the airport and doing 2 dives in the afternoon. Steve joined us by this time, coming over from Australia to do a cave diving refresher then diving with us. We decided to go back to Eden to do some check out dives with him and to see River Run again. I led the first dive with Dave, and ended up missing the River Run line on the left side and taking the cavern line. It was still a fun dive. On the second dive we got into River Run and it was nice. We all agreed why Eden was picked as a training cave, it was wide, had a halocline and was not decorated much. After the dives, we ran some line in open water and practiced gas sharing in touch contact. It all went well, and we were pretty comfortable that there were no big differences in the training we had compared to Steve, who had trained with the NSS. In the video compilation I made, there is a section of us doing our gas sharing practice with Steve. The next day we decided to go to Temple of Doom. It was known for its giant giant stride entry. The cenote had a steep ladder coming up, and it was easier to drop the 15 feet into the water. It was an extremely hot day, and before getting geared up we put on our drysuits and jumped in while taking some video. We had directions on the mainlines, and Jim and I set off to find the Canyon line. 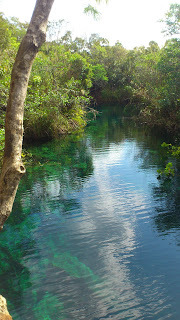 We ended up running our reel almost all the way around the cenote. I did actually find the mainline in this run, but wasn't forceful enough in my communication, and second guessed myself. We did find a line, but it ended up heading into very small passages and we turned it quickly. On our next dives, we took the Madonna line and it was pretty nice. I don’t remember a lot of details though. Temple of Doom got its name from the name of the cenote “Calavera” or Skull. When viewed from below, the three holes of the cenote looked like the mouth and eyes of a skull. We had heard of a “secret” cenote from a Kiwi couple staying in Mexico City, Ali and Cameron. It was called Fenomeno, and it had a Mayan pot and some fossil bones. We had originally thought to save it for the last day of diving, but on talking to Christophe he said we should really check it out sooner in case we wanted to go back (it was that good). Fenomeno was even further back in the jungle than Nohoch, and it took a long time to get to. It was worth it though. There was what looked like 2 mainlines, and we took the one on the right. 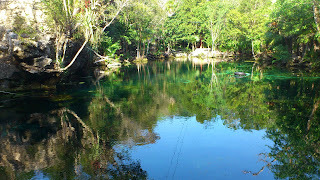 Both lines started in open water, which was not that common in the cenotes. Usually the mainlines were farther back so that snorkelers and cavern divers didn't follow them. The right mainline stopped not far in, and a little ways away we could see the real mainline. We weren't sure why someone installed this short line. We went back and tied into the real mainline and did the dive. Fenomeno was amazing. Very decorated, nice white passages, clear water and fairly shallow. Discussing with some other cave divers who were doing the cenote across the road, they told us how to find the fossilized bones. We did a dive to try and find them. I had to turn on gas just as we reached the spot, but the other team was able to push on and found the Mayan pot. They second guessed the hole with the bones and missed those though. Still it was an amazing cave. Greg had mentioned the Imax line in Dos Ojos, where some documentaries were shot, so we decided to go check it out. Dos Ojos was a very large cenote, with a lot of complicated cavern lines. There were multiple entrances to the cenote as well. We were kind of confused as to where to start, even with directions. Finally we found the entry at the Second Eye, and started to follow the Barbie cavern line. The instructions said to follow the Barbie cavern line until you saw a rubber crocodile with a Barbie doll in its mouth. Then on the left of that were the mainlines. Unfortunately, we all started too far away and ran out of line before even getting close. We reset and moved closer and finally got things sorted out. The First and Second eyes connected together by a fairly short distance. If ever I needed to recommend to somewhere who didn't want to do full cave training, I would recommend them to go to Dos Ojos. You could get much of the same feel for cave diving in the cavern there, and you could probably spend at least 2 days diving the caverns themselves. We found 3 mainlines in the end, and we tried them all. The first one on the left was short, and led to a small cenote entrance through a small passage. It would be useful for training in small spaces. The Imax line was in the middle, and it was pretty nice. It was highly traveled so there was a lot of damage to the cave along the line. I still enjoyed it. The last line to the right led through some very large wide galleries with rock pillars. It seemed like the pillars were holding up the Earth. The galleries were not tall, but flat and wide and seemed to go on for ever. In this way, it was a very interesting and unique cave. Someone had drawn and happy face in the sediment on the floor, and such senseless graffiti really detracted from the cave. People are incredibly short-sighted. With the low flow in these caves, scars on the floor would remain for thousands of years. 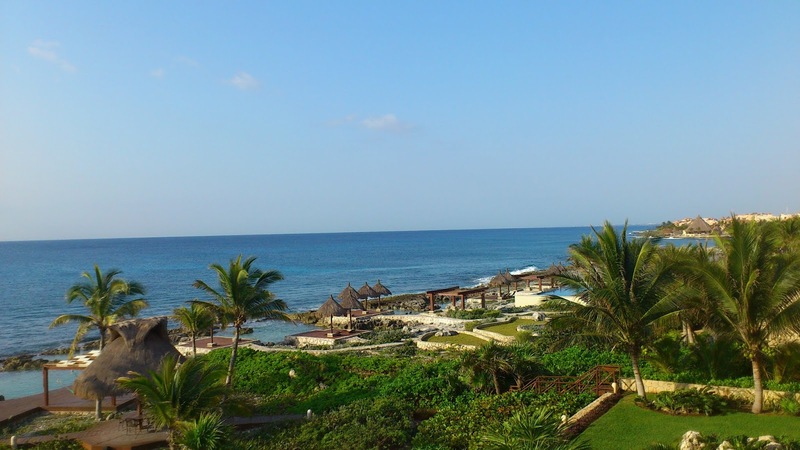 We went back to Mayan Blue the next day, and it was as amazing as the first time around. I had more of an appreciation for the darker A tunnel, and Steve and I checked out the Dead Zone briefly. It would be worth more exploration some other time. 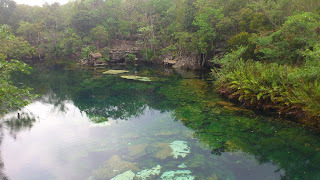 The next day, we went back to Grand Cenote to take the gap that we missed the first time. We made it, bridged the gap, and continued on more. Grand Cenote turned out to be one of our favorite dives. We also came across some howler monkeys that lived in the Peurto Aventuras complex, and put on a show for us swinging from tree to tree. On the next day, we went back to Nohoch to explore the lines in the zipline tunnel. The line to the left was amazing, going up very shallow, and was highly decorated. The second line to the right ended up leading to the mainline, and was one of the first jumps off of it. It was an interesting line, but short. Jim and I agreed we’d have rather done another dive on the line on the left. The left hand line had Styrofoam cups attached to it for distance markings. Jim and I made it about 1500 feet in or so. We wondered how they carried the cups into the cave in the first place, because they were so buoyant. Cups made a poor choice for markers in that some had come loose and were floating in the cave. On the second line, we came across a purple organic deposit that we had no idea what it was. We ran a spool to it to check it out, and it was a vibrant purple colour. It did not look like there were any openings where it came in through the rock. It was covered in a kind of spider web material too. It did look organic, but we didn't know. On the other line when Jim and I were exiting, there was a guide and some sidemount divers in tow coming in. There was a lot of room, but the guide decided to start taking video of his charges, and ended up coming all the way across and crashing into Jim. He apologized, but it was very inconsiderate. Exiting teams of divers got the right of way, because they could be low on gas. Obviously the guy was much more concerned about filming his group than etiquette. We were starting to have a hard time deciding on where to go next, but some discussion with Fred came up with White River. It was even further past Nohoch and Fenomeno, and he said it was even easier to get to the Mayan pot from there. When we asked him about the bones, he said “there are no bones on the mainline”, but he knew we knew. On the ride through the jungle, the narrow road at the end was bad luck for the van. I was driving and scraped the side of the van badly on a tree, just after Steve commented that there was no pressure driving on such a winding narrow road. Oh well, that’s what insurance on rental vehicles is for! The White River site got its name from the floor of white sand that it had. The mainline ran straight through the cenote in open water, coming from Fenomeno and continuing further on. There were a lot of mosquitoes at White River; we really were in the middle of the jungle. Dave and I took the line leading to Fenomeno first, to check out the pot and the bones. On the way we ran into a large group of divers. First two side mount divers passed us, and we ended up being on some of their GoPro video. Then we happened on an even larger group in the gallery with the bones. All the groups were coming up from Fenomeno. There were at least 6 divers in the gallery/ We waited until they cleared out, then tied in a spool and dropped a cookie and ran a line into the hole with the bones. The bones did not disappoint. They were extremely interesting. There were conflicting opinions on what the bones were from; some people said giant sloth, some said mammoth. On the way out, I got a chance to finally look at the Mayan pot. It was quite a bit larger than what I had thought. It was amazing. Christophe would later tell us at our last dinner that the pot had been significantly moved since he had seen it several years before. People were disturbing things in the cave again. On the second dive we went up the line from Fenomeno, and that was an even better dive. We went to Naharon next. This was across the road from Mayan Blue. It was a dark tunnel, and here I learned to appreciate the darker caves. The cavern entrance was so big that you couldn't really get a sense of where the sides were. It was essential to take a compass heading and follow it. There was one mainline, and one jump that you could run a reel to. Steve and I did both. The passages of Naharon were as decorated as other caves, but since they were stained with tannin, you had to look harder. But when you did, there it was. There was a lot of halocline here, and it added to the coolness. Steve and I played around with a blind exit on the way out on one of the dives, and it went well. Naharon changed my mind about dark caves. It didn’t seem to be a very popular site with divers. Someday, it would be awesome to do the traverse that was possible. and go from Naharon to A tunnel of Mayan blue. We also met up again with the German couple that we ran into at Nohoch and White River before. They were diving sidemount. Inside Naharon, they took a picture of Steve and me. I hoped to get this picture off of them someday. Steve and I did a bit of messing around on video. He put his dive knife in his mouth, and almost choked on a huge mouthful of water! 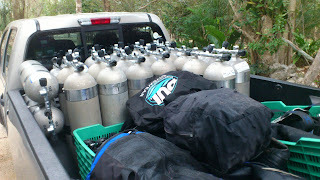 For the last day of diving, we visited Dos Palmos, which was beside Dos Ojos. It was a much quieter and laid back site, with better decorations and a much less travelled feel. There was a poor monkey on a chain in the yard. I gave him an apple. He looked pretty sad. Naharon was deeper, but maybe even more decorated than other places. We all agreed that it was an excellent high point to end on. There was also flow that we had not really encountered before. On the second dive, we went with it, and coming back against it was a bit tiring. We made it to a small cenote where we surfaced briefly to check out. It was very interesting being able to pop up somewhere else in the jungle! What else can I say? Three weeks of diving in the cenotes of the Yucatan was beyond what I had imagined. I learned a lot about myself, my mind, and my diving. And I had a boatload of fun to boot! Many of our discussions during the trip were aimed at the future, and the next cave diving trip. I couldn’t wait! Here is the compilation video I made of the whole week.